Mention Indramayu to any Indonesian and you are likely to get an excited response about fresh, tasty mangoes. 200 kilometres east of Jakarta, Indramayu is renowned for its mango produce. This is not its only export however: it is also a prime source region for workers headed abroad. With approximately 16,000 workers employed in Hong Kong, Singapore, and Taiwan, Indramayu is currently Indonesia’s second biggest sender of workers abroad after Lombok Timur near Bali. Since Justice Without Borders (“JWB”) focuses on cross-border civil litigation in the host jurisdictions of Hong Kong and Singapore, Indramayu is an important focus area. 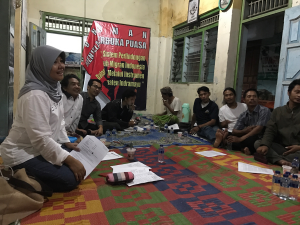 The JWB Indonesia team set out on a four-hour long journey to meet with local community organizations about migrant labour issues within the community, and conduct training for caseworkers at the Indramayu branch of our partner NGO – Serikat Buruh Migran Indonesia (“SBMI”, the Indonesian Migrant Workers’ Union). Our primary objective was to train caseworkers on how to recognise viable cross-border civil claims for returnee migrant workers and then collect all relevant evidence necessary to put together a claim. SBMI’s caseworkers are often migrant workers’ first port of call, and thus play an important role in seeking eventual compensation. Our meeting was a continuation of JWB’s overall efforts to partner and train NGOs across Indonesia on cross-border civil claims. One challenge facing caseworkers in understanding possible claims abroad is the difference between Indonesia’s legal system, and the common law systems of Singapore and Hong Kong. JWB addressed this issue by using sample scenarios from real cases to illustrate various legal concepts. Participants responded quickly, easily identifying situations which might have violated the employer’s duty of care to the worker. Participates also received an overview of the Hong Kong and Singapore legal frameworks on migrant worker salaries, employer obligations to fund medical expenses, and agency fees. The fact that the systems on paper are not always enforced helped to emphasize the importance of identifying and pursuing the cases that the caseworkers encountered. Our final key message was the importance of clients holding on to as much documentation as possible. Very often, workers sign payslips and contracts, only to never see them again. In some cases, workers had never even seen their work permits or employment passes over the course of their employment. We advocated that every worker obtain a second smartphone (to guard against employer theft), and to send photos of documents immediately after signing, via WhatsApp, to family members back home. Buying a roaming data SIM card in Indonesia before going abroad was also offered as a strategy to ensure that photos could definitely be sent whenever workers needed to. Despite the long day of fasting in the midst of Ramadan, and the effects of the buka puasa food coma in the evening, our partners in Indramayu were enthusiastic, sharing their own experiences and strategies in dealing with problems in the migrant worker space. We were encouraged by the productive training session and our partners’ enthusiasm for pursuing just compensation. We look forward to working with SBMI Indramayu to help sure that their clients can continue to pursue compensation, even after returning home.